Japanese Prime Minister Shinzo Abe, left, poses with Chinese President Xi Jinping before a group photo session at the G-20 summit in Hangzhou, China, Sept. 4, 2016 (AP photo by Ng Han Guan). 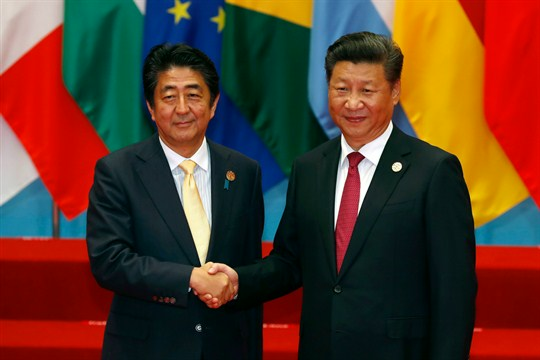 Last week, at a meeting on the sidelines of the Eastern Economic Forum in the Pacific port of Vladivostok, in far eastern Russia, Japanese Prime Minister Shinzo Abe and Chinese President Xi Jinping agreed to improve their long-strained bilateral relationship. It was their seventh meeting since late 2012, though each one has been on the sidelines of international gatherings, rather than full-fledged bilateral visits. The reason is that, up until recently, China has been hesitant to court Japan and restore traditional high-level exchanges through state visits, especially since their relations fell off a cliff seven years ago due to tensions over the disputed Senkaku Islands—referred to as the Diaoyu by China—in the East China Sea.